K2’s foray into the freeride market is a solid one. And truth be told, if they’d come out with this boot five years ago, people would’ve had come to Jesus moments. As it is, the Pinnacle is a solid contender but there’s a lot of powerful and ergonomic boots these days. Nevertheless, the Pinnacle will deliver as a resort based tool. K2’s Pinnacle 130 is, if anything, a little overbuilt. It’s a smart muscle car. The alpine inspired freeride boot has a traditional overlap construction, and a performance inspired custom Intuition alpine style liner, which is a bit heavy; the lower is closed cell foam for intimate fit, but the upper is bolstered with plastic (as is the tongue) for purported better power transfer. After I heated them up that become apparent, even standing in my garage. On the hill, the boots were almost too cozy, but the liner/shell interaction worked in concert for a smooth, responsive feel. I spent an entire morning marauding around the resort on a pair of Kastle 108s. Through the bumps and skied-out terrain, the stout boot insulated my feet from the less than savory conditions, absorbing the variety of hard snow, boilerplate and beat up crud. I have to say that the Pinnacle’s hefty mass should take credit as muscle often comes with weight. K2 calls their walk mode the Energy Interlock System, melding the virtues of alpine power and AT ergonomics, in a seamless transfer from one to the other. I’d say it’s close, but not perfect. The lock mode worked, but I did feel a little give in nefarious conditions, though most often the flex was smooth and predictable. Because the DIN sole is flat, the Pinnacle misses out on any benefits of rockered technology that would add to the better than average walk function. The soul of the Pinnacle, pun intended, are the tech fittings built into the DIN platform scaffo (lower shell). 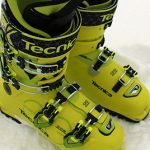 At once, the Pinnacle can fit into any alpine, tech, or carriage style AT binding, making the Pinnacle very attractive to thrifty patrollers, guides, or schoolers who want an utterly dependable downhill boot that can go anywhere if it needs to.